1.Prepare outdoor grill for direct grilling over medium-high heat. Brush both sides of onion rounds with 1 tablespoon oil. 2.Place watermelon and onion on hot grill rack; cook 10 to 12 minutes or until watermelon and onion are charred, turning once halfway through cooking. Remove from grill; let stand 5 minutes. 3.Cut watermelon into about 1-1/2-inch chunks and chop the onion. 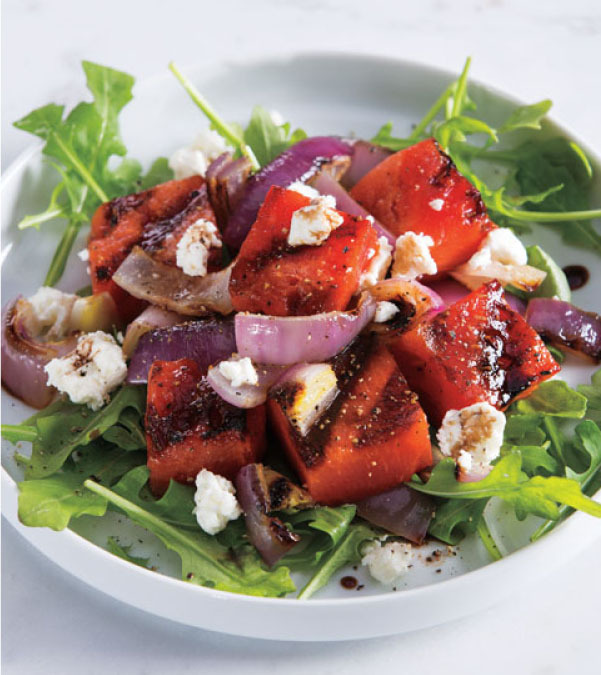 In large bowl, toss cheese, vinegar, salt, pepper, watermelon, onion and remaining 2 tablespoons oil. Serve immediately over arugula, if desired. Makes about 7 cups.